The Kettering Health Network presented the Boom-n-Blast Festival at the Preble County Medical Center on Sunday, June 28. 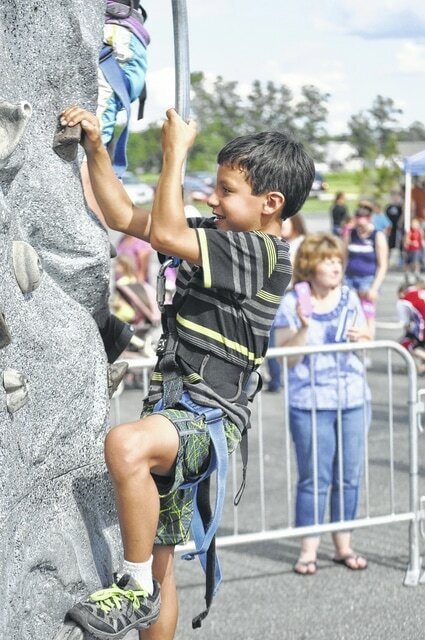 The event included a bike rodeo, food, inflatables, water games, face painting, and a rock wall. The night was capped off by a concert by Adelee & Gentry and the Worley Boys along with an ice cream social. Fireworks followed the concert, kicking off the July 4th holiday week. PREBLE COUNTY — The July 4th holiday in Preble County brings with it more weekend chances for fun and fireworks in area communities, and at the Preble County Historical Society. On Friday July 3, Andrew Gaydosh & Associates will present the 15th Annual Lake Lakengren Independence Day Celebration in Lakengren. This year’s celebration will include an 8 p.m. water-side concert featuring Josh Garrett, and fireworks at the dam beginning at 10 p.m.
On Saturday evening, July 4, West Alexandria will hold its “Celebration in the Park,” beginning with a parade at 1 p.m. At 2 p.m. there will be a bike rodeo. From 2-3:30 p.m., there will be a K-9 demonstration from all five units in Preble County. From 4-7 p.m., the “Big Bang Boom!” Cruise-in Car and Bike Show will be on display, and at 9:30 p.m., there will be a lighted parade through town to Twin Valley Schools, where fireworks will begin at 10 p.m.
And, on Sunday, July 5, the Preble County Historical Society invites everyone to its Old-Fashioned Independence Day Celebration. The free community event begins at 2 p.m. and ends at approximately 11 p.m. following the annual fireworks display. The celebration and its activities are held at at The Preble County Historical Center, located at 7693 Swartsel Road, Eaton, near Gratis. 2 p.m. — Raising of the Colors at the flagpole in front of the Saylor-Swartsel House, presented by Cub Scout Pack 206 of Miamisburg. 2-11 p.m. — Food will be available for purchase at the Carriage House Café provided by Buckeye Jake’s, plus Ullery’s Homemade Ice Cream, the Johnston Family’s snow cones, cotton candy, pretzels, popcorn and caramel corn. 3 p.m. — Music by the Eaton Community Band. 4 p.m. — Music by the Eaton Community Chorus. 6 p.m. — The evening program begins with the singing of the National Anthem by Sophia, Tess, and Grace Murphy followed by the 2015 Sara Swartsel Hall of Honor Inductions at The Amphitheater, and dedication of the plaques for the 2014 and 2015 inductees in the Hall of Honor Garden. 7 p.m. — Recognition of 2015 Summer Events Series’ sponsors. 7:30 p.m. — Music at The Amphitheater by Justin Bryan and Chris Mowen. The show is sponsored by Thumb Up Productions/The Worley Boys. At 9 p.m., The Worley Boys themselves entertain at The Amphitheater. At dark, the fireworks begin at The Amphitheater. The fireworks show is sponsored by Reid Hospital and Heath Care Systems. These sponsors make it possible for the Historical Society to bring the Old-Fashioned Independence Day Celebration to the community with no admission charge.